Take charge now for even younger, more beautiful skin. 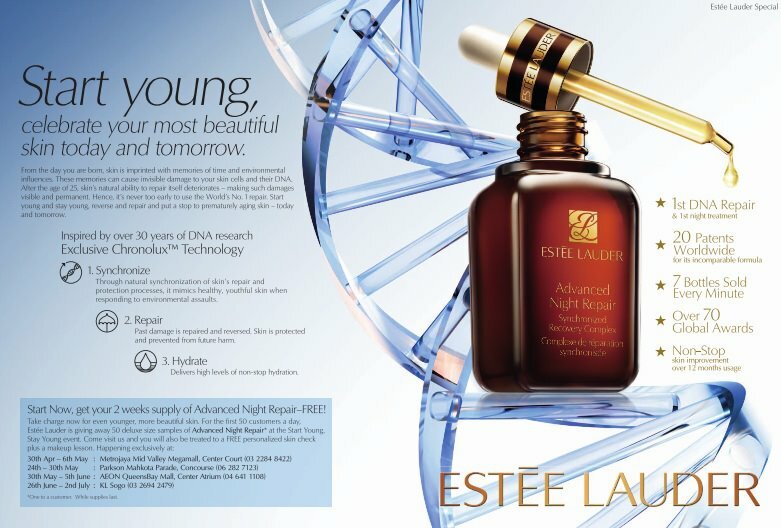 For the first 50 customers a day, Estee Lauder is giving away 50 deluxe size samples of Advanced Night Repair, at the Start Young, Stay Young event. From the day you re born, ski is imprinted with memories of time an environmental influences. These memories can cause invisible damage to you skin cells and their DNA. After the age of 25,skn' natural ability to repair itself deteriorates - making such damages visible and permanent. Hence, it's never too early to use the World's No. 1 repair. Start young and stay young, reverse and repair and put a stop to prematurely aging skin - today and tomorrow. SYNCHRONIZE ~ Through natural synchronization of skin's repair and protection processe, it mimics healthy, youthful skin when respoding to environmental assaults. REPAIR ~ Past damage is repaired and reversed. Skin is protected and prevented from future harm. HYDRATE ~ Delivers high levels of non-stop hydration.